The CW will soon be launching the third television series in the network's shared DC Comics universe, Legends of Tomorrow. The new show will combine characters from both Arrow and The Flash to create an entirely new superteam, the titular band of legends. Making the jump from Arrow are the resurrected Sara Lance a.k.a. White Canary (Caity Lotz) and scientist/CEO Ray Palmer a.k.a. Atom (Brandon Routh). Meanwhile, metahuman duo Martin Stein (Victor Garber) and Jefferson Jackson (Franz Drameh) a.k.a. Firestorm, Leonard Snart a.k.a. Captain Cold (Wentworth Miller), and Mick Rory a.k.a. Heat Wave (Dominic Purcell) transition from their roles on The Flash. Legends of Tomorrow will also feature Kendra Saunders a.k.a. Hawkgirl (Ciara Renée) and Carter Hall a.k.a. Hawkman (Falk Hentschel) who were previously introduced on Arrow and The Flash, while new character Rip Hunter (Arthur Darvill) will act as the team's leader. Now, new promos for the series focus on certain members of the team. 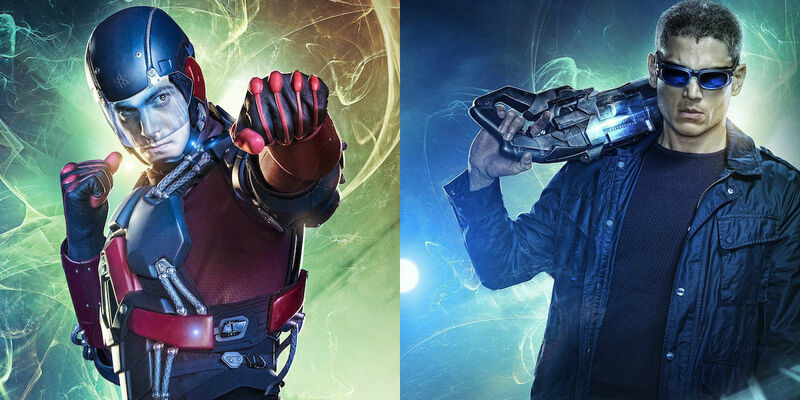 The CW released two more of its character-centric promos, this time focused on Captain Cold (above) and Atom (below). The promos showcase who they were on Arrow and The Flash - describing Captain Cold as a "villain, thief, scoundrel, rogue" and Atom as a "maverick, physicist, inventor, rebel" - before highlighting their transition into heroes and legends. The promos come as part of The CW's marketing push for the new series, with these videos specifically meant to introduce any viewers unfamiliar with Arrow and The Flash to Atom and Captain Cold. Previous promos focused on Hawkman, or the team as a whole, while the network has also released a clip from the premiere episode. Additionally, CW will be airing a special, Legends of Tomorrow: Their Time Is Now along with new footage from Warner Bros. and DC Comics' 2016 big screen releases, Batman V Superman: Dawn of Justice and Suicide Squad. The biggest highlight of these two new promos, in addition to featuring a handful of new scenes, is their focus on both Captain Cold and Atom's differing sense of humor. Captain Cold's promo specifically brings attention to his brand of snark: "You mean you don't need anyone killed, maimed, or robbed." Meanwhile, the Atom promo reminds viewers why he quickly became a fan-favorite character on Arrow. Of course, Legends of Tomorrow is an ensemble cast - and a rather large one at that - so Captain Cold and Atom will be in the mix amid seven other heroes. As a result, it wouldn't be surprising if they didn't have the entire focus of the show (even though they were some of the first characters announced for the spinoff). But, that being said, both of these new promos are sure to remind fans why they enjoyed watching these characters on Arrow and The Flash - as well as get viewers excited to see rogues and rebels join forces on Legends of Tomorrow.